A dynamic and committed ally for young people of color, CC is the former Director of the Cross Cultural Leadership Center (CCLC) which he founded in 2007 at Chico State University, to provide support services and a safe space for students of color on the Chico State campus. CC’s dedication to AES and the young people it serves have helped it deepen and grow its work over the years. He is a graduate of Chico State and has been working on campus since 1980, where he has held a variety of positions in the Student Activities Office, Office of Judicial Affairs, and Department of Athletics. 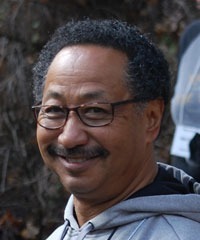 Over the years he has received numerous awards for his outstanding service at Chico State, including: Outstanding Black Faculty Staff Member; Staff Employee of the year, Outstanding Service award for Multicultural Council and Advisor of the Year. CC’s passions are his family, helping students to succeed, and playing sports. His ultimate goal in life was to build a Center that creates opportunities for students to make a true impact in the lives of other students. He did that through the CCLC and their partnership with AES. He is married and the proud father of three boys.